Trying to keep a clear head in this crazy world. Family Balance Sheet is hosting a monthly post for Christmas Savings Plan on the 25th, Jan-Nov 2013. I just buy gifts for my side of the family, my immediate family, and for a few friends. My husband is on his own for his family since I got tired of having to go through him to find ideas and sizes etc. We also have split our money to have our own account, to stop the money fight. I try to help his family when I can in my own way aside from gifts. For my nieces and nephews we spend $30 on each, and then we don't buy for adults because it has gotten too hard. I usually do spend on my mom and dad, but they always say they don't need anything. Their birthdays and anniversary is also in November so this last year we did go in together to buy my dad a new laptop. For my mom I got her a few boxes of Keurig coffee which I get coupons and buy them from Bed Bath and Beyond. 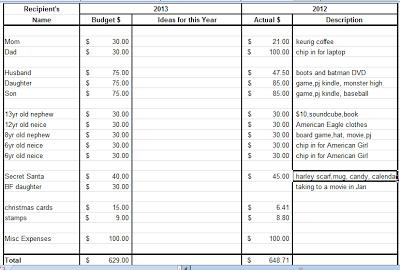 I think my actual 2012 Christmas total was actually over $675, plus I was not counting eating fast food or any relaxation needed because of the season. This is why I added in the extra expenses $100 category in my chart.My husband did help pay for some of the expenses for my kids, he paid $200 towards the kindle. 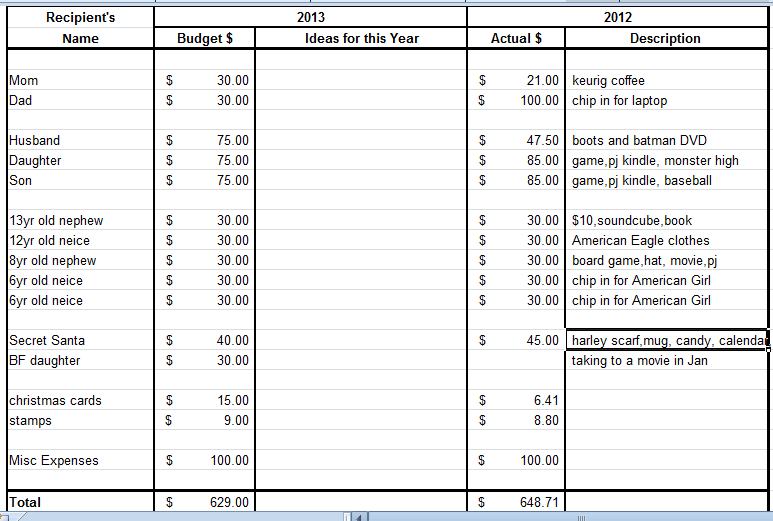 I want to be better about tracking my spending in 2013 so I can have a better handle on Christmas spending. I though about if I should not participate in the Secret Santa at work. It was only 4 days but I ended up spending $45. When I thought about it I decided to do it again if offered because it was nice getting gifts for those days. So far I have been good in January about keeping to my budget. I will need to save $57.27 in 11 months or $63 in 10 months if I start shopping earlier. I received some money for my birthday so I was able to set aside $100 for the Christmas fund in January. One other thing that I counted on a lot this year was the rewards programs that I collect points on throughout the year. For the most part of 2012 I was saving the rewards for Christmas. Next month we will need to have opened a separate account for the Christmas account. I think I will look into an online account. I have never had one and they do make me a little nervous but not having the money available so readily might be what I need to keep saving for the next 9-10 months. I've had an online account for about 10 years. If you go with a reputable one, there is probably nothing to worry about. I use ING Direct and have been happy with it. I'm looking into Ally for an online bank too. Their rates might be slightly better than ING. I will have to look into those. I would really like to find a deal where they might give me a bonus for opening up an account with them. Copyright Absentminded Mother. Picture Window theme. Powered by Blogger.